A 21-Day Corporate Fast January 8-28 2019. I believe that the fast will truly change the lives of those who choose to go down this journey with us. This is not for the faint of heart, but for those who are truly seeking all that God has in store for them. Fasting is a sacrifice and a discipline, both of which are keys to success in any area of life. 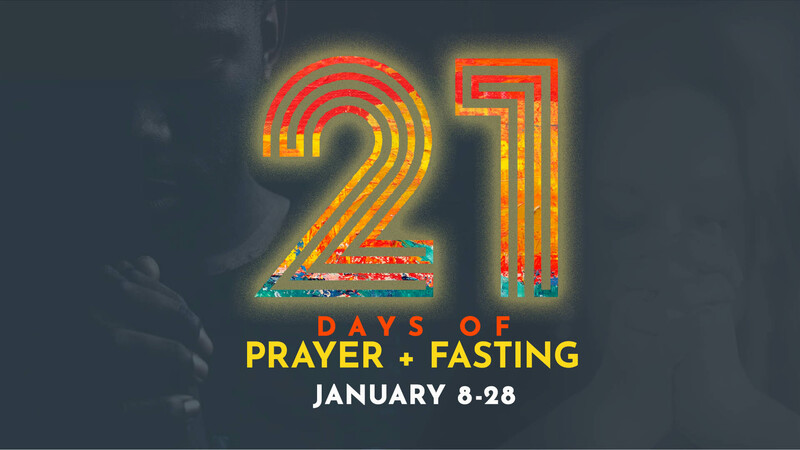 I am asking you to make some sacrifices for the next 21 days, as we thirst and hungry for righteousness. I leave you with this if you want something that you have never had, be willing to do something that you have never done. You’ve done it your way long enough, Try Jesus. And when He had gone indoors, His disciples asked Him privately, Why could not we drive it out? 29 And He replied to them, This kind cannot be driven out by anything but prayer and fasting. By the strength and grace of God, I commit to the above fast. Day 10 Blessings and Favor on Our Year – Deuteronomy 11:8-15, 28:1-8, Joshua 1:7-8, 1 Chronicles 4:10, Psalms 5:11–12, 84:11-12, Proverbs 3:1-10, Isaiah 55:10-12, Romans 8:28-32, Philippians 1:2-6. You have freedom in this Daniel Fast to modify it according to your personal physical and spiritual needs. You can modify these guidelines as you feel led by the Lord. If you feel that it would be more productive for you spiritually or physically to avoid certain foods or spices, that would be great. If you feel led by the Lord to eat only vegetables and drink only water, then do so! Daniel seemed to eat only things planted for harvest and drank only water. You may want to keep it simple and eat only fruits, vegetables and drink only water. If in doubt about a certain kind of food, read the guidelines above again! Legumes: dried beans, pinto beans, split peas, lentils, black eyed peas, green beans, green peas, peanuts, etc. Grain legumes include beans, lentils, lupins, peas and peanuts. Vegetables: artichokes, asparagus, beets, broccoli, brussel sprouts, cabbage, carrots, cauliflower, celery, chili peppers, corn, cucumbers, eggplant, garlic, gingerroot, kale, leeks, lettuce, mushrooms, mustard greens, okra, onions, parsley, potatoes, radishes, rutabagas, scallions, spinach, sprouts, squashes, sweet potatoes, tomatoes, turnips, watercress, yams, zucchini, etc. Seeds: all nuts, natural peanut butter, natural almond butter, sprouts, ground flax, ,etc. By application, that means that we are avoiding all those things that the Jews couldn’t eat. We’re also avoiding foods that only royalty in ancient days could afford. It wasn’t until recent history that most Americans could afford to eat meat or poultry. In most of the world today, very few people can afford to eat any kind of meat or processed foods, like the following items to avoid. Meat, because Daniel didn’t want to take the chance of eating non-kosher meat and/or meat that was offered to idols.